We all like to think that emergencies only ever happen to others. Unfortunately, this mentality, as much as we wish it to be true, does nothing to prepare for the reality of a disaster. If you’ve ever needed emergency HVAC service at the height of summer or in the grips of winter, you understand the importance of preparation. As a business, commercial HVAC system downtime during extreme winter quickly leads to uncomfortable employees, disappointed customers, lost revenue, and missed opportunities. That’s why it’s critical to develop a backup plan in the even to a critical HVAC failure. If it’s too late and you’re experiencing an emergency, here are some quick tips to get your system back up and running as quickly as possible. If, on the other hand, your organization wants to take a proactive approach to HVAC emergencies, here’s what you need to know. Before you call an HVAC contractor, there are some quick steps you can take to see if you can get your system back up and running on your own. If your HVAC infrastructure won’t turn on, first check your breakers to make sure power hasn’t been cut off. Simply restore power at first to see if that resolves the issue. If your system is repeatedly tripping the breaker, there’s likely a deeper underlying issue that needs correcting. Other factors to check include thermostat issues, dirty air filters reducing airflow, or debris that’s congesting condensers. A quick check of these systems may solve the problem, saving you the expense of having to call an HVAC company. However, if none of these quick fixes get your HVAC running again, it’s time to get in touch with the professionals. 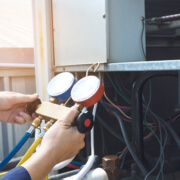 While you may want to see if you can fix the equipment on your own, small issues quickly become major problems when you don’t understand the intricacies of your HVAC system. The most straightforward way to handle an emergency is to take steps to avoid one altogether. By taking a proactive approach to your HVAC system, you can avert disaster altogether. 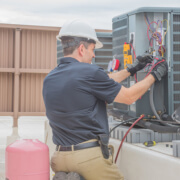 A proactive approach includes seasonal maintenance appointments, corrective repairs, and efficiency upgrades that keep your heating and cooling equipment operating at peak performance while maximizing the longevity of your HVAC investment. At the same time, when you partner with an HVAC contractor to develop a proactive maintenance plan, your partner takes a personal approach to understanding the intricacies of your system while prioritizing your organization’s needs. That means in the event of an emergency your HVAC contractor will have you at the top of their list for handling emergency repairs. During peak seasons, when other businesses are scrambling to find emergency service, you’ll know exactly who to call. At the same time, because they already understand how your HVAC equipment works, they’ll be able to more efficiently assess your system and pinpoint the root cause of the problem. That means your heating or cooling system will be back up and running sooner than you thought possible following an emergency. If you’re interested in taking a more proactive approach to HVAC emergencies, contact the experts at Garrison Mechanical. We’ll take the time to understand your HVAC infrastructure, maximize energy efficiency, and make sure your organization stays covered in the event of an emergency. Plus, you’ll always know exactly who to call for all of your installation and service needs. Spring is in the air, and now’s the time to ensure that your air conditioning system is ready to handle the peak heat of summer. Not sure where to start? In this post, we’ll share three simple steps you can take today to ensure your HVAC systems are running at peak performance, saving your business time and money in the long run. How long has it been since you replaced your air filters? Depending on the load demand of your system, we recommend replacing air filters on a monthly basis. This approach is one of the simplest, most cost-effective ways to prevent inefficient or damaged equipment. At the very least, you should be changing your system filters at the beginning of each season. Dirty filters restrict airflow circulation and don’t filter air as effectively, quickly leading to system issues and a decreased lifespan. Plus, your team can replace air filters in a matter of minutes, instantly improving air quality and system performance for a minimal investment. Between the peak seasons of winter and summer when your HVAC infrastructure demands the most energy, spring offers an ideal time to perform an energy audit. Take the time to total up how much your current HVAC systems are costing you. Chances are, you’re paying more than you’d like. If so, consider the possibility of upgrading your equipment and total up how much capital you’d be willing to invest in any upgrades. An energy efficiency upgrade can start saving you money right away while making the most of your existing equipment. From there, you can consult an HVAC contractor to see how much an upgrade could save you, potentially offsetting the cost of your upgrades in energy savings. 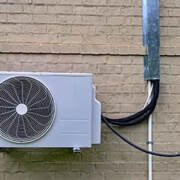 By completing upgrades in the spring, you can be confident that your air conditioners are prepared to perform at peak efficiency, even during the intense summer heat. While there’s a lot you can do to maximize the value of your HVAC systems, there are some tasks that are better left to the professionals. Tuning your equipment up after the winter is one of those things. A springtime preventative maintenance program can reduce the risk of critical a system failure that results in downtime and revenue loss. By proactively upgrading equipment, checking refrigerant levels, inspecting parts, and calibrating your thermostat, an AC maintenance appointment can quickly get you prepared for the summer. After all, making the time for an hour-long maintenance appointment in the spring is a lot easier than having to deal with a day-long system repair at the height of summer. 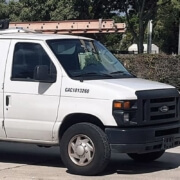 Whether you’re ready to schedule that springtime HVAC maintenance appointment, or you need emergency service, contact the highly-trained heating and air conditioning experts at Garrison Mechanical today. Centrally located in Pembroke Pines, we’re here for all of your HVAC installation, service, and maintenance needs. The Environmental Protection Agency (EPA) is in the process of phasing out ozone-depleting substances (ODS) like R-22 refrigerant in the United States by 2020. HCFC-22, also known as R-22, is one of the more popular refrigerants on the market today. Even if your organization’s air conditioning system relies on R-22, you have a variety of options moving forward. Here’s what you can and can’t do when it comes to the R-22 refrigerant phase-out. If your existing infrastructure uses and already contains any R-22 refrigerant, you can continue using it without legal penalty. However, if your organization plans to keep running equipment with R-22, the EPA recommends planning out a way to repair or replace any leaking equipment so that you can recover and reuse any refrigerant. Since R-22 won’t be readily available for purchase, you will plan on storing recovered R-22 to service any of your own equipment. However, once you run out of R-22, do not count on being able to obtain more. Once 2020 arrives, you’ll need to start looking for a more sustainable R-22 replacement solution. If your organization is planning to expand your AC system now or in the near future, new R-22 cannot be used to increase cooling capacity. Upgraded and expanded systems are still considered new systems, so you have to use either reclaimed R-22 or an alternative refrigerant. 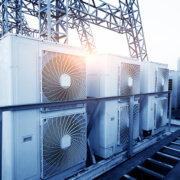 If you’re planning on making extensive HVAC equipment upgrades, you should plan on finding a system replacement that does not depend on an R-22 supply. If you’d like to continue using R-22 for the time being, feel free to do so. Just be aware that the importation and production of R-22 will become illegal on January 1, 2020. You should be prepared for the price of after-market, new, and reclaimed to rise sharply as individuals and businesses are purchasing R-22 to sell after the phaseout. If your business wants to expand or upgrade your HVAC infrastructure, plan out a budget ahead of time for the long-term expenses of your HVAC system after R-22 has been phased out. You’ll likely discover that a more sustainable infrastructure update will end up saving you in the long run, so you can spend more on the upgrade itself. That’s why we recommend your organization starts pursuing environmentally-friendly initiatives that don’t rely on R-22 today. That way, you can break away from R-22 dependence and be better prepared for the challenges of tomorrow. With a wide range of R-22 refrigerant alternatives already on the market, switching over to R-22 replacements couldn’t be easier. Many options are even more efficient than R-22, so you can save money on electricity and utility bills. On top of improving energy efficiency, these options do not deplete the earth’s ozone layer as R-22 does. As each day passes, there are fewer and fewer reasons to continue relying on R-22. If your organization is planning an upgrade or new installation now or in the near future, contact the experts at Garrison Mechanical today. We’ll help you explore your options and find an ideal solution to prepare you for the future. The air quality of your workspace is largely dependent on effective ventilation support. Your air ventilator will be responsible for several factors that affect the way your building performs. Whether you work in a small facility or a large corporation, a commercial ventilation system will be the answer you need for quality air conditioning control. Essentially, it’s a cost-effective way to keep your building at a comfortable temperature, while also preventing harmful contaminants from entering endangering your workforce. To many, it’s a principal component for effective heating and cooling, and ultimately, optimal building support as a whole. Using an exhausted ventilation system is a wise way for one to keep stale air out of bathrooms or other smaller areas of the building. 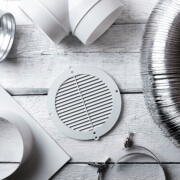 Exhaust fans will help pull in fresh air in spots where there is often air-leakage and high-moisture. This is a simple and cost-effective method that only requires the use of strong negative air pressure. As long as the proper air inlets are in place, you’ll be able to fill the space with adequate amounts of fresh, breathable air. A supply-only approach requires the use of a heavy-duty air fan system. The fan introduces fresh air and quickly deters any stale oxygen out of the building. If you want to keep radon and other contaminants from entering your building, then this is the proper ventilation method to support your building with. When it comes to supplied-air, there are multiple ways to execute this filtration strategy. You can provide a strong air supply through air ducts, a distribution system, or you may be able to force heat through a specialized dispersal channel. Supplied air filtration is a surefire way to support your working environment with comfortable, pressurized air. When it comes to proper air filtration, perhaps the best method to utilize is balanced ventilation. A balanced ventilation system combines the best of both exhaust and supplied-air tactics. With balanced ventilation, you’ll get support from separate fans and exhaust-driven airflow. This will ultimately give building managers better control of the fresh air that circulates throughout the facility. You’ll be delivering more comfortable fresh air into large common areas, while simultaneously filtering out unused moisture and pollutants out of your workspace. Whether it’s exhaust, supplied, or balanced air, Garrison Mechanical will be there to help keep your building is safe and breathable condition. As expert mechanical service providers, you can always count on our team to help you save energy, cut utility spending, and improve the overall condition of your workplace. Want to know which ventilation strategy is the most ideal for your building structure? Contact us today so that you can find out for yourself. Give us a call to set up a free consultation with one of our expert technicians. The heating and cooling equipment is one of the fundamental parts of your business. Without proper HVAC support, you can expect to see a loss in productivity, which may put portions of your business in shambles. Just think about your air conditioner burning out on the hottest day of the summer. What about if there is a gas leak close to your furnace? These are critical issues that could put your operation out of commission if they are not handled appropriately. For these reasons (and plenty more), it makes sense to develop a partnership with a professional HVAC company so they can take care of any emergency repairs in order to keep your business properly intact. If an emergency breaks out, you may need to shut off your HVAC system, and if it’s bad enough, you may need to shut down your operation entirely. Any downtime can cause your business a significant amount of loss, taking away your ability to provide a service. Emergency heating and cooling providers will be there to remedy situations with your heating and cooling systems in immediate fashion so you can continue to focus on running a profit-turning operation. Disaster can strike at any time, from any angle. Many times a catastrophe will occur when we least expect it, and that might be when your HVAC system is needed the most. When it comes to managing your HVAC, 24 – hour emergency service is a critical necessity. You’ll need a reliable source of support ready at all times. Before you sign the dotted line on any service agreement, make sure that your HVAC provider has a 24/7 support system just in case there is a repair service needed outside of standard working hours. Working alongside a trusted emergency HVAC specialist gives you the ability to keep your facility at a consistently comfortable level. When an emergency with your HVAC system is fixed, the service technician will make sure that your equipment is performing with high levels of efficiency. This, in turn, will help lead to more productivity from your entire workforce. HVAC emergency services cost significantly lower than full-scale installations. Instead of breaking the bank on new equipment, you can preserve your current HVAC equipment with an emergency tuneup. This way, you’ll be able to save big and improve the longevity of your building’s most important utility system. When it comes to proper HVAC management, there is no one better to have by your side than the experts at Garrison Mechanical. With us at the helm, you can expect more comfortable heating and air conditioning, fewer headaches and stress, and a safer working environment overall. If you want to get the most optimal results from your HVAC system for less then contact us for complete details today. Give us a call or visit our office in Pembroke Pines to schedule a consultation with one of our emergency service technicians. The two most important aspects of any business includes the facility and the employee workforce. The next pivotal piece to any operation is the HVAC equipment. If you are a business owner, the commercial HVAC system is responsible for a lot of things including office comfort, energy usage, and a large portion of your utility bills. 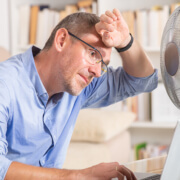 Fortunately, there is a way for you to mitigate any headaches that stem from your office’s heating and cooling equipment. The answer lies within the guidance and expertise of an established commercial HVAC service. In today’s age, it’s important to go green. Operating with more environmentally friendly equipment can help you reduce harmful waste, paving room for you to use more natural energy sources. When you work with a commercial HVAC specialist, they’ll be able to support you with a plan that is sustainable for both your working and community environment. Working with a commercial HVAC provider helps you preserve your energy usage. You’ll be able to consult with an HVAC specialist and determine a strategic plan that will help you keep your equipment running at an adequate level throughout the day. With a commercial HVAC professional by your side, you won’t have to worry about expending too much or less energy. Your business will flourish with appropriate temperatures and air quality at all times of the day. Working in an office that is too cold or hot just isn’t ideal. Work environments with less ideal temperature conditions can negatively affect the way employees perform. When you work with an experienced HVAC contractor, you can always trust your office environment to be kept at a consistent and comfortable temperature. This will mitigate employee frustration and should boost productivity as a result. HVAC management is much more than just temperature control. It also encompasses air conservation. The older your HVAC equipment is the more debris, dust, and other carcinogens that will likely circulate throughout the facility. This can even spread carbon monoxide around the building, making it difficult for your employees to breath. When you partner with a commercial HVAC contractor, you won’t have those issues. They’ll support you with state-of-the-art solutions that are equipped with better air filtration features, which will create a healthier environment for your employees to work in. What do you normally do if the air conditioner breaks down in the office on a scorching hot day? You could schedule an air conditioning repair, but don’t expect that to be a walk in the park. Commercial HVAC repairs are expensive services that can set you back quite a bit. This is why preventative support is crucial. Professional service technicians will help provide routine maintenance to make sure that your heating and cooling systems are always running at an optimal level. A commercial HVAC installation can cost a small fortune. By working with an HVAC contractor, you’ll be able to save big in the long run. With fewer repairs and less energy usage, you’ll be able to enjoy the luxury of lower utility bills as a result. This will give your business more wiggle room in the budget, so you can allocate for the most important thing – growing your empire.